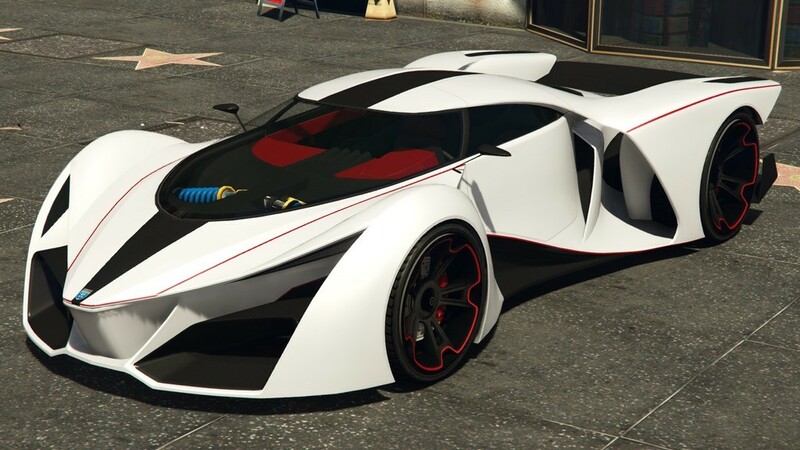 The Grotti X80 Proto is a two-door hypercar featured in GTA Online as part of the Power Play DLC Update. 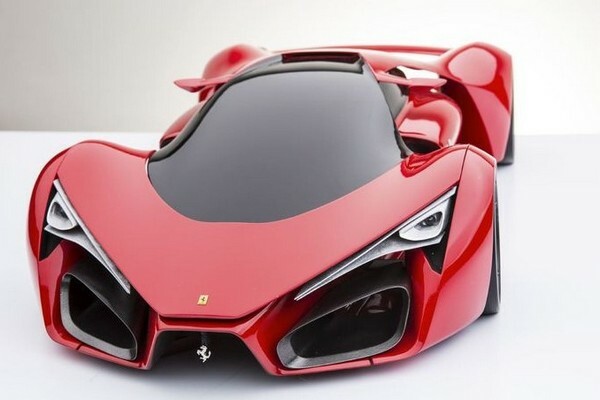 The X80 Proto is the first car in the series to be based on a concept hyper/racing car, which is based heavily on the Ferrari F80 concept car. The frontal styling, seen especially in the grille area, side profiling, and intakes. From the front windshield can be seen two shock absorbers and springs for the frontal suspension. On the rear of the main cockpit, a window split into is found formed by a carbon fiber stripe running down the roof of the car. The side features a lot of progressive curves which originate from the front fenders and curve down to the bottom of the car, directly in front of the wheels. From here, two large intakes are open on either side; half of each split towards the engine bay, while the other half cools the tires and allows better acceleration through aerodynamics. The rear of the X80 Proto is very exposed in that no bumper is seen hiding the entire rear fascia. The cockpit of the vehicle curves to the very end of the back of the car, where it narrows into a thin, streamlined hexagonal polygon, at the end of which is a small grille with the license plate fitted within. A small F1-style red light can be seen placed directly under this grille. Two rectangular exhausts exit either side of the rear of the vehicle. Under the exhaust area, a 6-bladed diffuser-style grille can be found finished in chrome. A carbon-fibre rear trim can be found, which seems to be based on the GreenGT LeMans prototype car. Like the Pegassi Osiris and Benefactor Stirling GT, the Grotti X80 Proto has gull-wing doors. The Grotti X80 Proto comes with some impressive interior upgrades for a supercar including a bunch of elegant dials and gauges, besides the Grotti logo on its steering wheel. In addition, you will marvel at the car’s stunning looks and glamorous design elements including the custom stock wheels. As expected, the Grotti X80 Proto is arguably the best performing car in the game. The car’s exposed bodywork and carbon fiber usage give it very little weight; comparable to the Benefactor Panto and Karin Futo. As well as this, traction is equally as good due to the all wheel drive layout. The vehicle’s powerful engine gives it the highest statistical top speed in the game, higher than that of the Truffade Adder by 1km/h. Now, there is no doubt in saying that the Grotti X80 Proto is definitely the Fastest car in GTA 5. The car also has rapid acceleration, although several over supercars, such as the Progen T20 and Pegassi Osiris are competitive in this field. In terms of handling, the car is equipped with separate rear flaps which individually lift up and down according to both acceleration and cornering, in a similar manner to the Progen T20. This gives the car excellent stability and control in cornering, however, the overall light weight and phenomenal power still prove too much in some instances, and cause the vehicle to spin out. The flaps also serve useful in braking situations. The car’s exposed bodywork mean it is incredibly vulnerable to damage and tires being shot out, unfortunately. The car can be fitted with numerous spoilers, front splitters, and rear diffusers. Once you are done gazing at its impeccable aerodynamic-body-design, just take the car to the LS Customs and you will be surprised to notice 16 customization options. 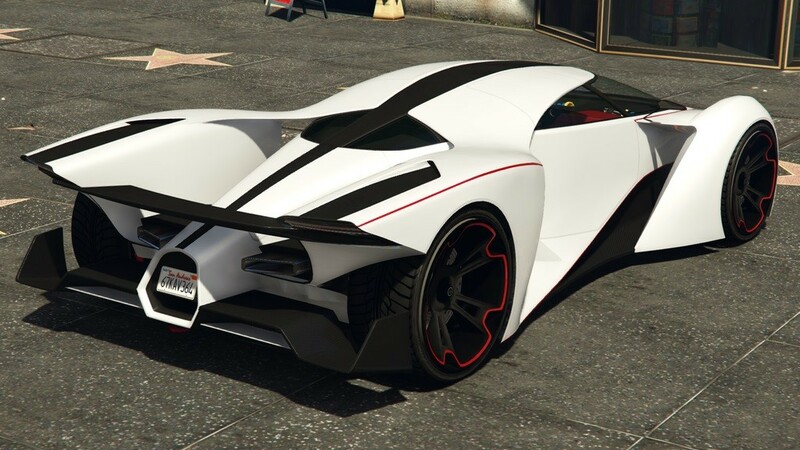 The Grotti X80 Proto is priced at $3,750,000 in GTA 5 story mode which makes it the most expensive supercar in the game till date. You could start with the front bumpers and then move on to the engine as well as exhaust upgrades. Don’t forget to put on the Xeon headlights as they give your car a super cool look. Tip #1: You could try matching up the color of its side-skirt with that of the front bumpers or stick to your crew’s color theme in GTA Online. Coming to the spoilers, you could pick the Race Wing which looks just amazing and precisely fits the color theme of your car. Then you can upgrade the suspension to either lowered or street suspension as the stock version itself has extremely low clearance. You might want to install the race transmission and the turbo upgrades if you really want to feel the engine revving and roaring back to life. If you aren’t satisfied with the car’s interior colors or its theme, you can try fiddling with the Trim color option to match your own taste. Tip #2: Using the Accent color option, you can change the thinly outlined stripes of the car at the rear as well as match it with the color of the rim on the wheel. Tip #3: You could either go with the vibrant red primary color theme or the elegant white color theme for the body if you want the outlined color stripes to stand out. Tip #4: Quite surprisingly, the Grotti X80 Proto features the identical gull-wing doors that are found on the Pegassi Osiris, besides adding a stylish tail-door near the spoiler. The trick to uncovering these Grotti X80 Proto is to visit Simian at the Premium Deluxe Motorsport showroom in Los Santos in story mode and ask him if you could check out some of his latest exotic rides. When you browse through the supercar collection in the inventory list, you can easily find an entry for Grotti X80 Proto which appears just above the Pegassi Reaper. Just select the Proto and then you can see the Vehicle Customisation option in the interaction menu. Just scroll down and you can see the Test Drive option which can be selected for a free trial drive across the lush meadows along the countryside roads. Now go ahead and hit confirm to proceed.